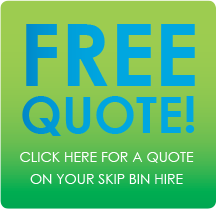 Want to know more about your skip bin hire? Please have a read through our frequently asked questions for more information. Skip bins are great for general household and garage clean ups, garden clean ups, moving house, building renovation and landscaping waste. We do not provide bins for Asbestos Fibro. Materials we DO NOT accept are food scraps, tyres, liquid waste, dangerous chemicals, acids and poisons, needles and syringes, gas bottles, explosives and any other environmentally unfriendly substances or objects likely to cause harm or damage. To dispose of these materials you need to contact your local Council. 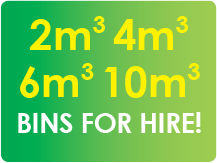 Our aim is to supply you with a bin size that suits your needs. Our bins range in size from 2m3 to 10m3. Please see bin sizes to see dimensions. What’s included in the price of a bin? When you call, one our staff members will ask you what size bin you require, what type of material is going into it and how long you require it. With this information you will be quoted a competitive price. Included in this price is delivery, pick up, GST and all associated tip fees. You will notice that our bins are labeled on the sides “Do not fill above rim”. For safety and legal reasons, skip bins should not be filled any higher than the rim and should be loaded carefully in order to avoid any spillage during transit. In the event that a driver arrives to collect your bin and it has been overfilled, we reserve the right to remove some of the contents and/or charge an extra amount for the excess. How much weight can I put in the bin? The maximum load for our skip bins are 1 tonne per cubic metre. This is the safe lifting limit. Max skip size of 4m3 for skips being filled with solid fill (i.e dirt, bricks, concrete, pavers etc) Skip’s greater than 4m3 are not permitted to be filled with any solid fill. What happens if I overload the bin? Where possible the driver will try to take the skip, once the overloaded item is removed from the top of the bin, the overloaded item(s) where possible will be left in a neat pile near the site of the bin. What happens if the driver can’t unload the skip? We will contact you and advise you that we are unable to remove the skip due to the overloading. We will then arrange for you to receive another skip from us to transfer the material into. This skip will be charged at the stated rate. Should you wish to book a bin please give us at least one day’s notice if possible so that we can supply the bin size you require. However, during busy periods e.g. weekends, long weekends and holiday periods we recommend you book your bin earlier. Please check with us if you need a same day delivery. We would hate to disappoint you. Bin hire is usually up to 7 days. If you finish with the bin sooner, simply call us and we will collect it. However, if you have not finished with the bin within the seven days please contact us ASAP to make alternative arrangements. Please note additional hire fees may apply for extended hire times. We will ask your requirements on arrival and place the bin in an appropriate spot for your ease of access that causes less impact on property driveways etc., and for our ease of removal once filled. Under NO circumstances is a bin to be moved due to OH&S reasons. Please note – Our trucks weigh between six and nine tones before they are loaded, Unfortunately, driving on grass can cause some damage particularly in the wet. Please be assured we will make every effort to ensure we don’t cause any damage. Should you have any concerns or special requirements please ask the driver at the time of delivery. Can we put the bin on the footpath? Generally, yes, however we cannot block pedestrian access or utility pits. Some Council’s will require a permit. Should you wish to put the skip on the road, it is necessary for the property owner to make application to Queensland Police. Payment is generally COD. We accept Visa and Mastercard over the phone, cash, cheque (by arrangement) or Direct Deposit. Please ask us for account details if you would like to pay by Direct Deposit. If you are unsure about any of the information on this page or have further questions please don’t hesitate to contact us. Please phone 5426 1256.